Probably the most often voiced objection to open immigration of all peaceful people is that “you can’t have open immigration and a welfare state.” (Even people as smart as Milton Friedman have made this objection.) But why can’t you? Well, people claim, if you have a welfare state, the masses of the world will flood into the USA just to collect the welfare state’s “free stuff.” But why let them? Even under currently existing rules, undocumented immigrants are ineligible for nearly all welfare-state benefits. If a flood of immigrants will break the welfare-state bank, why not simply make immigrants ineligible? Case closed. Notice, however, that in this case the anti-immigrationists, having just insisted that the government is too incompetent to exclude ineligible immigrants from welfare-state benefits, now presume that the government is so competent that it can keep undocumented immigrants out of the country. This assumption is manifestly counter-factual, given that more than 10 million such immigrants are estimated to be living in the USA at present. So, which is it, anti-immigrationist: is the government too incompetent to exclude ineligible recipients from getting benefits, or is it too incompetent to keep illegal immigrants out the the country—or is it both? If the government is simply incompetent at everything it does, then it doesn’t matter what immigration policy is adopted: whatever it is will fail to be implemented successfully. 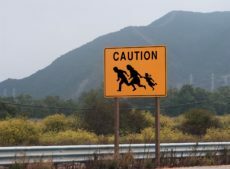 At this point, of course, some anti-immigrationists will claim that the government is not too incompetent to exclude ineligible recipients from receiving benefits, but is deliberately giving them the goodies in order to flood the country with more future Democratic voters and anti-capitalist residents. But if the government is thus engaged in a conspiracy against its own stated laws and policies, what difference does it make that the government purports to be closing the borders, whether with a wall or with a string of random tactical nuclear explosions along the border? If the government cannot be trusted to carry out its own stated policy in one area, why should anyone trust it to carry out its own stated policy in another area? Oh, what a tangled web they weave when once they turn to the government to do—well, pretty much anything. Robert Higgs is Senior Fellow in Political Economy at the Independent Institute, author or editor of over fourteen Independent books, and Editor at Large of Independent’s quarterly journal The Independent Review.